I stopped at one of our bigger wine stores in town to stock up on several bottles as we were having friends over for a cookout on Memorial Day. I quickly found several chardonnays that were decently priced and then turned my attention to the Pinot Gris. Seeing that the Kings Estate was on sale with a savings of $6.00/bottle I reached for one. The lady who was helping me locate the Pinot Gris stopped me and pointed out today's reviewed wine, the 2007 Ferrari-Carano Pinot Grigio. Telling me it was new to the Arkansas market, was every bit as good as the Kings Estate, and was also priced at $14.99/bottle, I let her talk me into this one. I wish I hadn't! Not that this is a bad wine, by any stretch, it's just no Kings Estate and it is definitely over-priced at $14.99/bottle. Some melon and peach were noted on the nose with kiwi, honeydew melon and lemon picked up on the palate. Not the kind of finish I like, rather biting and harsh, made this wine mediocre in my book. I can't recommend this wine at any price point above $7-8/bottle. I gave it 2 Corkscrews and only arrived at that rating after my second day of tasting. I thought it might get up to the 3 Corkscrew rating the second day but, alas, it wasn't meant to be. I suggest laying off this one unless you get a great, closeout price on it. Sit Long, Talk Much, Laugh Often, Drink Wine! After finally catching up on a ton of paperwork at the office, I was able to sit down and jot a few lines about our recent trip to Chicago and Geneva, Illinois. Next week I plan on sourcing some new wine and getting back to posting reviews. The first wine we had a chance to try during our trip was on Saturday and it was a 2005 The Frenchhouse Sauvingon Blanc from the south of France. A very fresh nose on this one with a dry, fruitful flavor and a nice, balanced finish. A very good summer wine that I gave 3 Corkscrews to for taste and good value at $9.00/bottle. Saturday also brought the discovery of Eno on Michigan Avenue in the Intercontinental Hotel. A great wine/cheese bar that we spent a delightful hour and a half in. We ordered a couple of wine flights with my favorite being a 2006 Eola Hills Pinot Noir out of Oregon, while #1 had an excellent Chenin Blanc from South Africa, name unrecalled unfortunately. We also had a couple of cheese tasting flights that included three of the best cheeses I've had anywhere! Included were a Delice de Bourgogne from Burgandy, France; an Old Chatham Sheepherding Co. Hudson Valley Camembert from Old Cotham, N.Y.; and a Brillat-Savarin from Normandy, France. We of course had both kids with us and our 8 year old decided she likes fancy cheese as much as her parents! She has been going to fine dining establishments since she was a month old so I guess we shouldn't be surprised. Check Eno out if you're ever in Chicago and I understand they are planning to open other locations throughout the U.S.
Sunday brought a trip to the 95th floor of the John Hancock Building (see photo). We had a 2005 Joel Gott Sauvignon Blanc that was decent enough and which I would probably order again. We also had another excellent cheese tray which our daughter actually let us have a little of. I recommend a trip to the top of the Hancock with one caveat. Skip the expensive observation tower tour and head straight to The Signature Room. No charge, better views! A couple of days doing the tourist thing, i.e., The Field Museum, Lincoln Park Zoo, left us wanting to return to our room at the Homewood Suites on Grand. Great hotel, great staff, excellent location, free breakfast and free happy hour with full buffet, makes this one easy to recommend. Although we took advantage of the free happy hour wine, we did try a 2006 Jenica Peak Pinot Grigio back in our room that was undrinkable. It was like drinking a bottle of sweet, Boone's Farm and tasted unlike any other Pinot Grigio I've ever had. 1 Corkscrew rating and over half a bottle down the sink! Tomorrow we head to Geneva, Illinois. Sit Long, Talk Much, Laugh Often, Drink Wine! Well I finally made it by my wine connect's store and stocked up on some new wines and a few, old favorites. The first one we tried was an Italian from Pasqua, the 2006 Pinot Grigio. Very light colored, almost transparent, with a very floral nose. On the tongue I picked up honeysuckle and melon with no spices noticed competing for attention. Very low acidity made for a pleasant finish. I gave this one 3 Corkscrews as I paid $9.99/bottle and feel like this wine is a decent value at that price, but not at a penny more. Sit Long, Talk Much, Laugh Often, Drink Wine! I wasn't going to buy this bottle but after talking to my wine connect, who assured me that Pepperwood Grove wines had gotten better, I took a shot. What's $5.99 in the scheme of things right? Folks I'm on a roll. I've been finding some really good values on some tasty wines of late and this 05 Pepperwood Grove Pinot Grigio by Sebastiani is another example. Very light, pale color in the glass was observed, almost translucent with aromas of citrus and fruit, (tangerine and mango come to mind), filling my nose. Tastes of honeysuckle and blended citrus was very evident with a nice, balanced acidity taking me to the finish. Drinking this wine was almost like drinking air, but in a good way! Very dry while at the same time being very fruitful in taste. At the $5.99/bottle I had to give this one 4 Corkscrews for its taste and its excellent value. I plan on reviewing Pepperwood Grove's Chardonnay in the next week or so and am looking forward to seeing if it has improved as well. In the meantime, try this pinot grigio and check out the Sebastiani/Pepperwood Grove film site if you get a chance. Very cool! Sit Long, Talk Much, Laugh Often, Drink Wine! My wake-up call at the Hilton was right on time, 6:15 a.m., and after a quick shower and some final packing I headed down to the breakfast buffet. Nothing to write home about but filling enough and the price was right. Free! I grabbed the shuttle at the hotel, free also, and disembarked at the Metro station for a 35 minute, or so, ride into downtown D.C. I had to make one change at Braddock but the Metro is the way to go in D.C. and probably one of the most reasonably priced forms of transportation there is. Beats a cab any day of the week! After my meeting I hightailed it for Reagan and was standing at the check-in line at 12:29 p.m. for a 12:55 flight. Cutting it close I agree but I was still there in what I argued, and still contend, was plenty of time as I wasn't checking any baggage. Of course, I HATE AMERICAN AIRLINES, informed me that I was too late and therefore had to go on a later flight. I grumbled, and realizing there wasn't anything I could do, took my boarding pass for a 3:40 flight. I did make my way to the gate where my 12:55 was leaving from and it hadn't even begun to board. Using my friendliest smile and tone I could come up with, I approached the gate agent and explained that I was willing and able to get on the flight, especially since they hadn't even begun to board. In the nastiest voice she could possibly muster, she informed me that "I've already chosen my standbys and you aren't getting on this flight"! I promptly pointed out that she was one of the many reasons I only flew AA when there was absolutely no other options. Didn't the government bail out AA a few years ago? Next time maybe they'll let them go to the airline graveyard they've earned for themselves. The beautiful thing was that the 12:55 flight sat at the gate until 2:15 p.m. for who knows why. My AA saga continues. Oh, by the way. Don't fly AA if you can help it as I've yet to have a good experience and I hate to see anyone else go through the torment they can cause a traveler. I'll try to finish this rant. When my flight landed in Dallas, on time, we got the added pleasure of waiting on the tarmac for 20 minutes as the plane at our gate had no crew. They were on the way but evidently hadn't made it. My flight to Little Rock from Dallas? Left on time, got in on time, then we waited 15 minutes for a ground crew to guide the plane in. Enough said about that but when I finally did make it home around 9:00 p.m. I was overdue for a nice glass of wine. Wine review here. When I opened our wine cellar I discovered that we had a bottle of 2005 Montevina Pinot Grigio. What a coincidence I thought. I had their Sauvignon Blanc on Wednesday in D.C. and here on Thursday I'm uncorking their Pinot Grigio. Needless to say I liked this grape offering much better than the Sav. Blanc. On the nose I was astonished how clean and crisp this was. I hesitated in taking that first sip because the nose was so good. When I finally did take that first sip I wasn't disappointed at all. Lots of ripe peach and apricot flavors filled my palate and the finish was absolutely wonderful. I almost gave this one 5 Corkscrews but this one was purchased at $12.99/bottle and based on the price I had to give it 4 Corkscrews for the taste/value combination. If I could find this more in the $8-10 range I would easily bump that up to 5! Try some and let me know if you agree. Sit Long, Talk Much, Laugh Often, Drink Wine! After a day of training and a somewhat abbreviated workout, the place we are staying at, The Piccadilly Inn, has a very, very limited fitness room, a group of us headed out in search of dinner. We landed at P.F. Chang's in Fresno and were promptly seated. Perusing the wine list I came across the 05 Tamas Estates Pinot Grigio and ordered a glass. When it was served I noticed right away that it really wasn't at the temperature I would have expected and was, in fact, more warm than chilled. I should have sent it back right then but decided to go ahead and drink it how it was served. On the nose I noticed an abundance of grapefruit and citrus but more grapefruit than anything. Much more than I like to smell in a pinot grigio. In the mouth this wine tasted almost carbonated with the aforementioned grapefruit still present on the tongue. The finish was a little too acidic for my tastes as well. I have a feeling that this wine is probably a much better wine when it is chilled properly and consumed on a nice, summer day. I gave it 3 corkscrews due to the fact that I will try this again under different circumstances and it retails for about $9-11/bottle so the value is there. Come June I'll track down another bottle of this and give it another chance. I'll let you know if it gets better, as I anticipate, or is worse. Sit Long, Talk Much, Laugh Often, Drink Wine! Good weather today and after an hour or so at the pool we all showered up, loaded in the van, and headed to the Riverwalk again. This time we came for dinner where we found a nice, upscale, mexican food restaurant with seating right on the Riverwalk. A place called Zuni Grill where I had an excellent pork dish that included three huge portions with a medium spicy sauce that was out of this world. The kids enjoyed their meals as well as did #1 and the frozen margaritas where also top notch. Check this place out if you're ever down in San Antonio looking for a place to have a great meal. Very reasonably priced as well. After dinner we took a boat tour on the River which the kids really enjoyed. Upon arriving back at the resort we discovered the fire pits ablaze in the courtyard and the front desk provided all the makings for smores including the sticks. We all had a great time making and eating smores til we could eat no more. This is one feature of the resort that we did really enjoy. When we got back to the room and took off all our smoky clothes, one drawback of open fire pits, we uncorked a bottle of the 05 Sterling Vitners Pinot Grigio. Now if you go to the Sterling Vineyards website you will find no mention of this wine. When I uncorked this and poured the first glass there was not a lot of nose to speak of as I've found in a lot of Pinot Grigio. 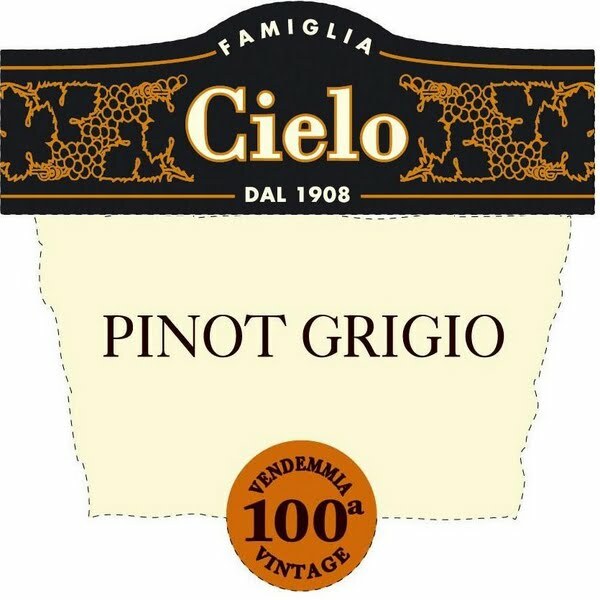 No problem as when drinking Pinot Grigio I'm expecting less body and more lightness. On the tongue the lightness continued with just a hint of vanilla, wheat grass and maybe a little honeydew. Good but not great so I ended up giving this one 3 corkscrews due to the $9.99/bottle price. Regardless of how this bottle turned out I do highly recommend visiting Sterling Vineyards if you're ever in Napa Valley. We toured it about 8 years ago, luckily got a VIP tour, and ended up drinking and eating there with two other couples for about 5 hours. Needless to say I have a fond place in my heart for Sterling! Sit Long, Talk Much, Laugh Often, Drink Wine!